It is interesting to note how one perceives beauty. You are free to think ill of me but I usually judge people based on how and what they perceive beauty to be. Is it the external appearance or do you make efforts to see the beauty of the soul? Do you see your own inner beauty? Do you see how beautiful life is in small moments? Do you stop and see the beauty in the bumble bees, the melody of the birds, gushing of the water and hushing of the winds? I see beauty in the smell of the rain, the wind that blows on my face and stealthily moves inside and plays with my hair, in the brilliant shades of flowers and everything nature could possibly ever make. There is so much beauty in the power of dreams and passion, you just don’t give up no matter what or who. My early 20s have been spent on learning the art of detaching a person’s physical appearance to their beauty. A pretty /handsome person isn’t necessarily beautiful. To be frank, at 20’s it is an extremely tough thing to do, where your friends discuss their crush because they are so hot, and you tread carefully and over time just judge the person without much fuss, while all your friends are wowed by this person, you have to patiently wait for others to realize the truth. And when I wait “appearances can be deceptive” keep running in my mind like a tape kept on repeat forever mode, although this has significance in altogether a different level. Plus this is just a silly example that we all go through, but the most important part is in India, beauty has a definition. Thin, fair and tall. Yeah, like we were all born models. What one needs to understand in their 20s is that you are beautiful/handsome as you are and also don not judge anyone based on their physical appearance, you would be shocked to know how badly we misjudge one based on looks. For someone in their twenty’s, this is a very tough thing to do. But my friend, trust me this way, the best stay, and the unwanted wither away. Being friends with a person’s soul is so beautiful, you got to experience it to know what I mean. What is your perception of beauty? Do you strive to make soulful connections? Beauty is always in the beholder’s eye. Why else do we overlook appearances and look into someone’s heart and click? I love how each person’s perception of beauty gives an insight into who they are. Your words are really wise! It is indeed very rare to find persons in their 20’s have this mature perspective of looking beyond the physical perfection. In fact people way older also don’t have this maturity. Agree, beauty is skin deep and it fades with age. But a beautiful soul is eternal. B-eautiful B post Ramya! Thankfully, I never looked for outer beauty when it comes to any kind of relation. Maybe because if I cant find a mental connection with the person no matter how beautiful he/she is I cannot maintain that relation. I’m kind of obsessed with talks and the person’s sound than his/her beauty. We’ve all grown up hearing, ‘Beauty lies in the eyes of the beholder’! And it holds true every single time! And we learn this a little late in life but it’s totally worth it! Well said Ramya. Though I did used to get crushes based on looks, they were nothing I took seriously. But when it came to judging a person, I always saw who they really are than how they look. 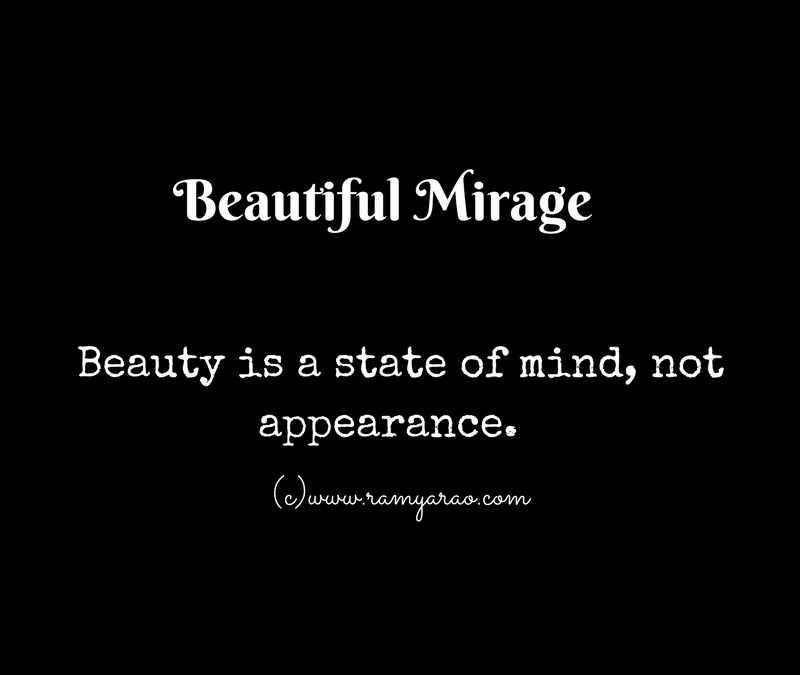 While, it’s the physical characteristics that attract us initially but it’s the inner beauty viz intelligence, humor quotient, attitude, mannerisms etc that matters in the end. Those are wise words, Ramya. If one can understand this in their 20’s then nothing like it! Well said! Such a beautiful reminder to seek people’s inner beauties. True, outward appearances fade. Wise words, and much needed in this self- obsessed-perfect-selfie world! I guess I’m still in that age where I can get away with swooning over a beautiful crush. I don’t, though. For me, intelligence is beauty, and I’d rather talk to someone intelligent than to hang around with someone just for their looks! I guess, people are attracted to beauty first. Perhaps the beauty of soul takes time to be discovered. But once it is, the outward beauty becomes merely skin deep. Beautiful thoughts Ramya, Loved the way you have essayed it. You spoke my heart here !! & this is what is required ..
To see beauty in the lil things in life..
To see perfection beyond the physical stature !! Our perceptions for beauty needs to be changed.Time spent to see the beauty of the soul is always worth for. You nailed it Ramya. In India especially people are obsessed with fairness and beauty. Inner beauty is important than outer beauty. Sadly people do not understand it. Wise words. The older I get, the more I see the beauty in every day things and in the actions of others. Physical beauty is temporary. Everyone has their own beauty – it doesn’t matter how beautiful they are outside and beautiful heart and beautiful mind makes a person rich! Beautiful post. Over the last few years, I’ve been contemplating the meaning of beauty, and I like your take on it.